"Eminence Front" is a song written and sung by Pete Townshend of The Who. It appears as the sixth track on the group's 1982 studio album, It's Hard. The single reached number 68 on the Billboard Hot 100. It is the only song from the album that the band has opted to play live after the initial post-release tours. Lead singer Roger Daltrey, vocally critical of the album, described "Eminence Front" as the only song on it that he felt was worthy of being released. In the song, Townshend sings about the delusions and drug use of the wealthy and hedonistic. The lyrics describe a party in which people hide from their problems behind a façade. Townshend has introduced the song in live performances with: "This song is about what happens when you take too much white powder; it's called 'Eminence Front'". In the originally released version, there is a timing flaw or a syncopation in the first chorus, where Townshend sings "behind an eminence front" at the same time Daltrey sings "it's an eminence front," with Townshend one syllable behind. A more linear-sounding remixed version appears on the 1997 re-release of It's Hard (a live version, recorded on the band's final stop on their 1982 tour in Toronto, appears as a bonus track on the re-release). Additionally, the remix has Townshend's vocals panned centrally rather than hard right in the stereo field. The song produced a video, shot at a rehearsal in Landover, Maryland, during their 1982 US tour, which enjoyed consistent airplay on MTV upon its release. Footage from the Who's 1982 concert at Shea Stadium was also used in the video. "Eminence Front" was scheduled to be released as a single in the UK by Polydor Records in 1982; the catalog number was WHO 7 but the single was never released. The picture sleeve, by Richard Evans, depicted a 1930s Art Deco house in Miami. The song is in the key of F minor. 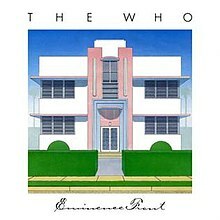 In a fully negative review of It's Hard, Robert Christgau gave faint praise to "Eminence Front" as the album's high point, sarcastically noting how the aging Townshend "discovers funk. Just in time. Bye." The song is used in the opening of the 1982 PBS NOVA episode "Tracking the Supertrains", during which the Shinkansen, TGV, and various research trains are seen traveling at impressive speeds. The song was used in the Miami Vice third-season episode "Kill Shot". CBS had intended to use the song as the theme song for the London-based spin-off of its popular CSI franchise, but the show was ultimately scrapped. In the first episode of HBO's Entourage, the song plays while the characters drive through during the red carpet scene. The song appears in the Local on the 8s forecast music, January 2010 playlist on the Weather Channel. The song is used in commercials for the FX series, The Americans. This song was also used in the second-season episode "Prisoner's Dilemma," of the TV series Person of Interest, when John was released from FBI custody. The song was used in GMC commercials starting in 2015, most notably for the introduction of the 2017 Acadia. The instrumental intro of the song was also used as news music package for WVTV "Newswatch 18" of Milwaukee, Wisconsin in the 1980s. The instrumental intro of the song is used to close out Michael Felger's and Tony Massarotti's radio show on Boston sports station WBZ-FM. It's also used as theme music for the Vicki McKenna show on Milwaukee talk radio station WISN1130. The Oakland Athletics, Los Angeles Dodgers, New York Mets and Dallas Mavericks have used the introduction to the song as background music for player lineup introductions. However, the Dallas Mavericks use a slightly modified version of the song's instrumental intro. UFC fighter Stephan Bonnar is a Who fan and uses "Eminence Front" as his entrance music. Another UFC fighter, Nate Marquardt, also uses this song as an entrance song before his fights. The song was the WWF intro song in the 1980s. The song was used in the trailer for the 2000 experimental film Time Code. In the movie Law Abiding Citizen, character Clyde Shelton (Gerard Butler) enjoys a steak dinner in prison while listening to the song on iPod speakers. Oddly, the DVD's subtitle track lists the song as "[Jazz music playing]" when the song is first heard in that prison cell scene, and upon returning to that scene after a cutaway the subtitle track refers to the same song, still playing, as "[Funk music playing]". The song plays in the movie version of Entourage as Vince and his friends walk the red carpet of the Golden Globes after being nominated for his movie Hyde. The song plays twice during the 2016 film The Infiltrator. Once nearing the end of the movie and again during its closing credits. The song is played on the radio station K-DST in the video game Grand Theft Auto: San Andreas and was also used for one of the game's trailers. It is available for download in the music video game series, Rock Band, and also appeared in Sleeping Dogs. ^ The Archivist (October 11, 2011). "Video Classics: Eminence Front" Archived 2013-01-31 at Archive.today. Wnew.com. Retrieved 2012-10-29. ^ Christgau, Robert (25 January 1983). "Christgau's Consumer Guide". The Village Voice. Archived from the original on 9 July 2017. ^ Arce, Manuael (Story); Ichaso, Leon (Director and Story); Kupfer, Marvin (Story and Teleplay) (October 10, 1985). "Kill Shot". Miami Vice. Season 3. Episode 47. NBC. ^ "'CSI: Crime Scene Investigation' Trivia". IMDb. ^ "The Weather Channel Music". ^ "The all-new 2017 GMC Acadia The Next Generation of SUV has Arrived". ^ "SouthernMedia's News Music Search Archive - News themes and news theme music". Southernmedia-nmsa.com. Archived from the original on 2012-09-09. "Why Did I Fall for That"
This page was last edited on 27 March 2019, at 08:19 (UTC).